Just wanted to share this new Volkswagen advert from DDB London. It made me smile. I think positive thinking makes all the difference. This idea gives a whole new meaning to the term ‘Recessionista.’ For those unemployed with a sense of humor comes these pins and t-shirt by the fellow unemployed Irina Blok who definitely found the bright side to her situation. 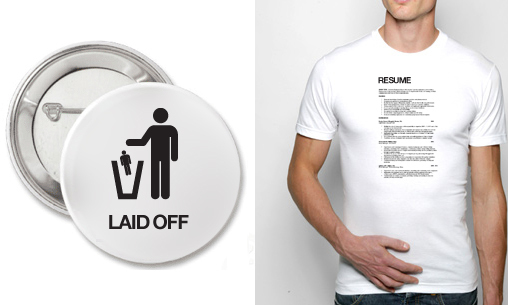 She created these pins and a Resume Tshirt, my personal favorite for those of you desperate to get your next paycheck. Check all of them out HERE. I also found her mini portfolio to be quite impressive, and her adorable swine flu masks. She definitely knows how to laugh at herself and the world around her.